Starter for ten… where and when are the best pub quizzes in West Hampstead and Kilburn? This is a question we get asked a lot, especially during the cold winter months. The Black Lion on West End Lane seems to get a lot of love on Twitter for its Sunday night quiz, but what are the other options? 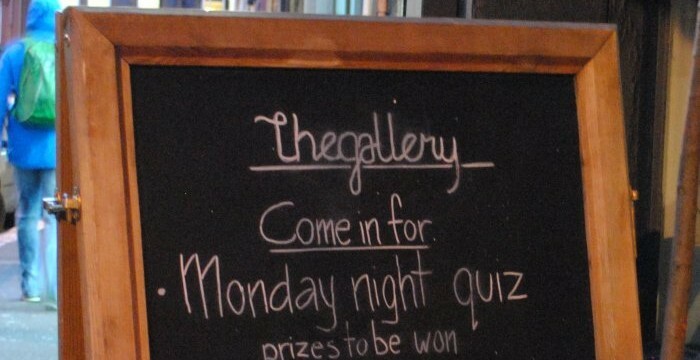 I set out to investigate the perplexing conundrums of which pubs hold a quiz, where are the biggest prizes to be won, and why are they all on a Tuesday? 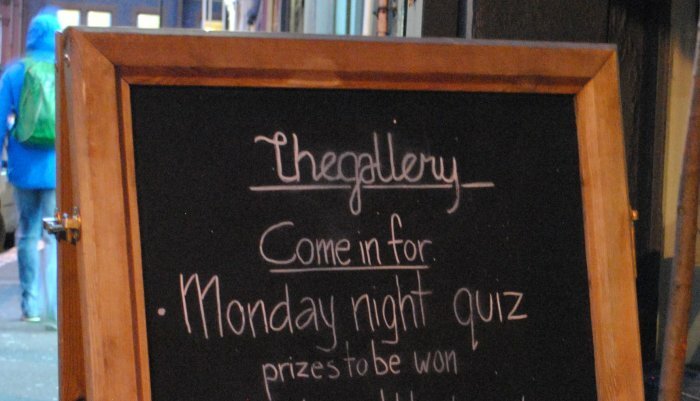 The Gallery, on Broadhurst Gardens, kicks off a week of #whamp trivia. It’s £1 per person to enter, with a maximum of 8 on each team. The winning team takes the jackpot, with runners-up getting a bottle of wine. There’s also a bonus point for the best team name. General knowledge, sport and music rounds feature at the NLT’s quiz. There are also game show games, such as Play Your Cards Right, in between rounds to win free drinks. The entry fee is £2, and the winning team wins the pot. For the lucky team in second place, it’s free shots all round. The Black Lion on Kilburn High Road (quiz points deducted if you go to the one on West End Lane by mistake) is also £1 to enter. The winning team takes the pot of money at the end of the night, and there are bonus “free drink” questions along the way. This is a music-themed quiz, so expect to hear plenty of song snippets from different genres to identify, as well as a picture round and other musical trivia. The winning team scoops the money pot, second prize is a bottle of wine, and the team in third place wins a “mystery booby prize”. £1 per person to enter. 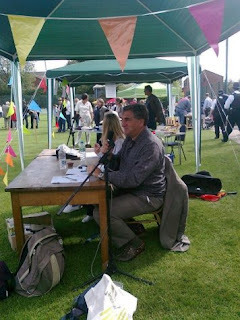 Quizmaster Ben Jones hosts each fortnight, with questions across a range of topics. It’s £2 entry per person, and maximum team size is six. The winning team takes 90% of the night’s money pot. The remaining 10% is put in a Prize Pig for the highest-scoring quiz team of the season (approximately 10 quiz nights). The winners can also enjoy a round of drinks for the table, as well as branded gifts – tonight’s is a set of Peroni pint glasses. This quiz has its own Twitter account – follow @PrioryQuizHead for sample questions. The Alliance has the largest prize pot of all, as the jackpot gets rolled over each week the tiebreaker question at the end doesn’t get answered correctly. The total currently stands at £1,273, so get yourself to Mill Lane on Thursday if you fancy your chances. Questions range across the usual categories, such as sport, food & drink and general knowledge. The team with the highest score on the night wins a meal at the pub. There’s also wine for the winner of the picture round. £2 to enter. The Sir Colin Campbell’s weekly quiz features a picture round plus a good mix of general knowledge, some local and London questions, as well as a bit of music. There is also a cumulative jackpot prize after the quiz itself. The pub advises booking in advance for this popular quiz night, especially if you have a bigger team (maximum 6 people) and want to settle into a booth. Sunday roasts are available all evening in case you need to nourish your brain cells. Questions include a picture round, name the song, and a cryptic round. It’s £2 to enter, and the cash is divided in varying quantities between the teams in first, second and third place. Over to you – Which NW6 quiz gets your vote? Have I missed any out? And why DO so many take place on a Tuesday? Comments are open below. Witch Halloween party is right for you?